I heard Renée DiResta on the Sam Harris podcast a while back, and was excited to learn that she just appeared on Joe Rogan as well. Her work is focused on misinformation campaigns, and she works at a place that tries to combat the problem. Anyway, I was listening to her and Joe talking, and I somehow started reading some YouTube comments, which I took a screenshot of above. I’m completely blown away. I’ve been reading about misinformation campaigns, and specifically the efforts by the Russians, since 2015 or so, and she’s been focused on it full-time for even longer. I’ve also read several books on the topic. I also have a military background with some dabbling in intelligence work during that time. Some of the campaigns launched against us during the 2016 election. Every fiber of my being tells me that the misinformation threat from Russia is absolutely real, and the research that’s documented this fact is overwhelming. 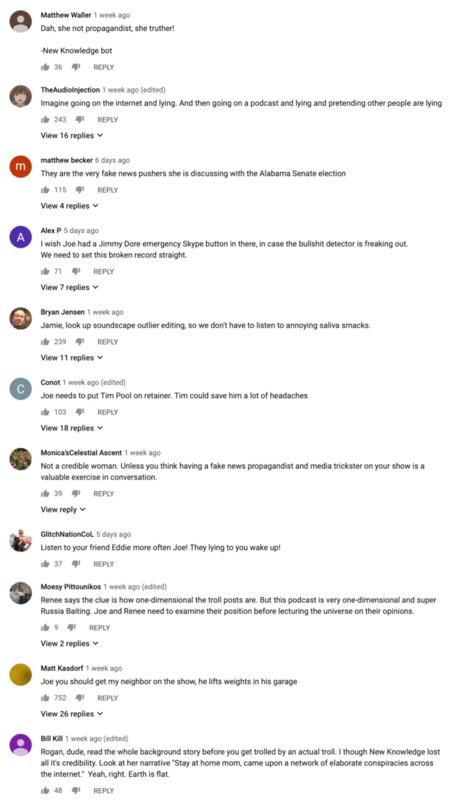 So that raises the question: why is almost every single comment on Joe Rogan’s podcast talking about Renée as if she’s the Clinton-Email-Antichrist? And why is it that every time I talk to my conservative friends about Russian influence, they downplay it massively and claim it’s fake news? Why? What’s the unifying thread? Especially when they went out of their way to say not everything is Russian influence, there are real people just being idiots, etc. Their discussion was remarkably measured and cautious, actually. It in no way matched the commentary about it. One of the most powerful dialectic lessons I learned in the last 10 years was that people reject what they don’t want to accept the implications of. If liberals were shown evidence that concealed carry made places safe, they would reject that evidence because they wouldn’t want to see more guns. Conservatives deny climate change data because they don’t want climate change regulations pushed down from a bloated, untrustworthy government. And it looks like we have the same thing here. Another option is that these comments are from a bunch of actual trolls as well, and are therefore not representative of his actual audience. It appears that conservatives (which Rogan’s YouTube is evidently full of) hate the Russian Influence narrative because it implies that an enemy exists that’s more dangerous than the liberals. Or, put another way, if they accepted that Russia really was actively tampering with us in a very Cold War type of way, they’d have to shift their focus off of Clinton’s emails. Or maybe become concerned with whether Trump has some unsavory entanglements with the same people. Just as with Climate Change, that natural result is too much to handle for them, so their move is to reject the evidence as fake news. That’s the world we live in—a world where smart people deny obvious truth because they don’t like what they think the implications are of accepting it. And the right isn’t the only side doing this. The left is being devoured by this as well. The only possible escape is something like the Intellectual Dark Web, which is mostly progressive people who are willing to talk about uncomfortable topics, accept truth, interact with one another in good faith, and then come together to pursue solutions. You’d think that Rogan’s fans would be into that, but their position on the Russia stuff (again, the comments could be misleading) is telling me they’re just blindly following their own religion without doing any independent thinking. It’s becoming so strange for me at this point. All I can do is read books and listen to people who have IDW mindsets, because everyone else seems horribly lost on either the left or right. The center is gone. Nuance is gone. Good faith is gone. And pressure is only increasing. As I said before, this is taking us towards dangerous territory for 2020 and beyond. Mar 24, 2019—A friend was nice enough to give me details on the counter opinion here, which is that the far left is doing the real damage to the country, and that this narrative about Russia from the NYT, et al, is basically a blame game designed to divert attention away from that.